This entry was posted in Home and Family, Other, Writing and tagged Friesian horse, Ladyhawke, Tyrone Guthrie Centre by jenniferscoullar. Bookmark the permalink. These pictures remind me so much of Black Beauty. I wonder if it was a Friesian as well. I’m not a rider but I love the look of these amazing animals. 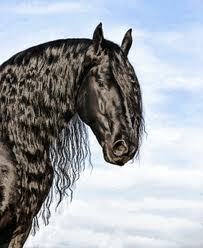 Black Beauty was actually a black American Quarter Horse stallion named Docs Keepin Time (AKA Justin). He is most famous for starring in the 1994 film adaptation of Anna Sewell’s novel. He went from having an unsuccessful racing career to being one of Hollywood’s most sought after equine performers. Docs Keepin Time also portrayed The Black in the American television series Adventures of the Black Stallion and Gulliver in the film adaptation of The Horse Whisperer … you can see what a horse nerd I am! With all due respect for those writing about Black Beauty, who was in deed, a wonderfully elegant animal for a Quarter Horse, this article shows a complete insult to Rutger Hauer whose horse that beautiful Freesian actually was portrayed to be in the Medieval fantasy movie “Ladyhawke”. Only ridden briefly by Michelle Pfiffer in one scene, “Goliath” looked awesome while doing what the Freesian breed does best; powerfully but gracefully move about with little or no command by its rider. 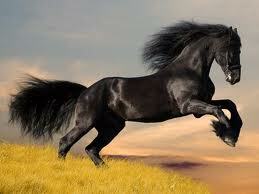 Can anyone tell me the true name of the awesome stallion ridden by Rutger during the movie? Having been filmed in 1985, I’m sure he has passed on by now (2012), but he remains a favorite part of my enjoyment of “Ladyhawke”, being “Captain Navarre’s” faithful mount. They were a grand pair. I’m sure in these days his siring of a foal would be worth several thousand, and his value would be in the millions undoubtedly. He was a beautiful match with Hauer dressed all in black with black sadle & tack. Hauer’sacquaintence training was simplified by the Freesian’s smooth gait and need only for gentle guidance by knee pressure and an occasional tap of the heel. They are enormous, but a true pleasure to ride! As the movie showed in one scene, “Goliath” took not only Hauer up and over a tall gate, but also a flailing Matthew Broderick being carried acorss Hauer’s lap. Freesains are not built to jump, but to display their grace! I would have loved to have one as well as my dear old Tennessee Walker when I was a child. 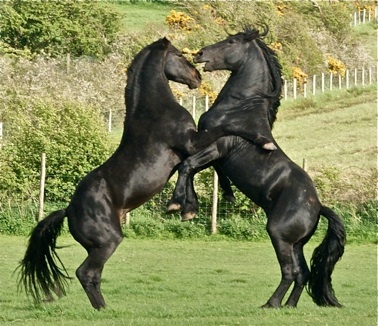 They share the same gentle, graceful gaits and dedication to their owner/rider.